I'm using the image because it is awesome. Oh, and as a reminder that the event ends April 24th at 2AM CDT. Someone has successfully reverse engineered a Black Hole implant... and they're BOE! I'm definitely using an alt to gather some Black Hole commendations and slowly build up a chance to get the pattern. RE'ing campaign gear (the shells) requires that it have an armoring in it - any armoring will do, including a level 10 armoring. 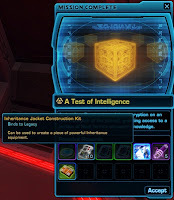 Birthright and Inheritance kits (legacy armor) can be found on crits of 340 mission discoveries! So far, I've seen them with Diplomacy, Slicing, and Treasure Hunting... but that is only because I haven't run any Investigation or Underworld Trading missions since the patch. 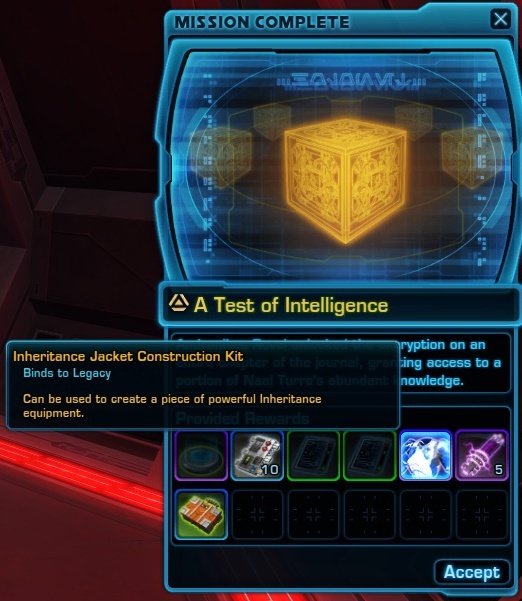 UPDATE: Oh wow, I just got a Birthright item on a crit of a Grade 6 abundant mission. (My first after running 300 of them.) Woah.